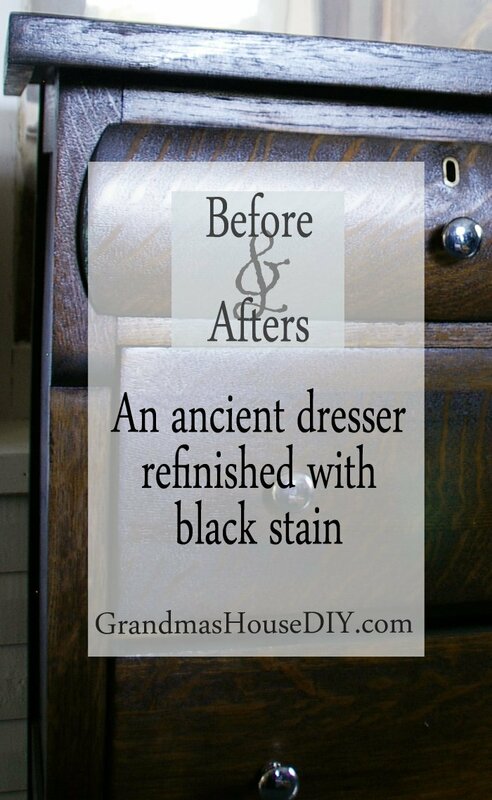 A dresser refinish before and after using black stain. Between this one and the oak dresser from the screened in porch I really don’t know which one is more of a mystery. 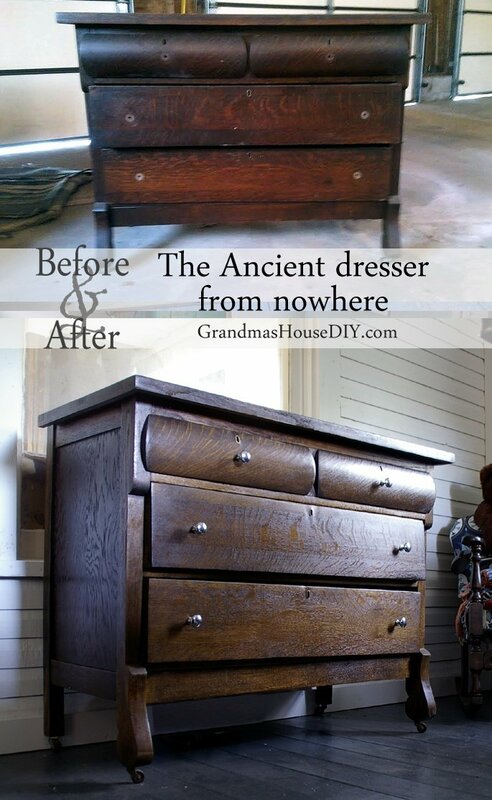 Neither dresser had been used in decades by the time I came along to refinish them. With the passing of my grandma we opened up the old play house and were both dismayed and delighted to find that it was full of furniture. I started pulling things out and discovered my mother’s two old dressers and this old thing with no idea where it came from. It’s beautiful and it always was beautiful even before I started work on it, I had an inkling that it was probably the most unique and also the oldest piece of everything I had. A friend of mine (who had a bit of furniture experience) confirmed my thoughts when he said he thought that this piece was worth the most out of everything. Of course, worth really means nothing to me (I’ll never sell it) however, knowing that it is special outside of my own feelings toward it is pretty cool. I sanded the whole thing down instead of stripping it and it just about killed me, definitely should have stripped all of the funk and gunk off of it first. I did this piece when I did Eleonora’s buffet/my entertainment center and I swear the same dude on the same day seventy years ago put the same nasty motor oil finish on them both. I felt like my arms were gonna fall off. I just sanded. And sanded. And sanded. *facepalm* The whole dresser probably has over ten hours of just me sanding into it. I should have just used paint stripper on it! Once I had it down to bare wood though I really got excited. The drawer fronts are striped, seriously, like a zebra! It is SO cool. I used every grit of sand paper available and mostly my orbital sander on the entire piece. I stained it in a black minwax gel stain using a brush and just wiping it off after a few minutes with a rag. After that I put two coats of a satin poly acrylic over it to protect the finish. I can’t get over the wood grain! I just love it! And then I put all my shiny knobs on it and I couldn’t have been more pleased. It sits in my office now, I never did manage to get the drawers working well so I just use it as storage that I rarely need. I really love it, can’t say exactly why, but out of all of the pieces that I’ve refinished over the last few years, this dresser refinish the one that holds my heart completely. It looks beautiul. You;re so lucky to have their wonderful pieces with you.Thanks for sharing with us at Thursday Favorite Things blog hop! You did such an amazing job refinishing this piece! It looks lovely I’m glad that you chose to stain it instead of painting it! Thank you so much! Once I saw those stripes on the drawers I was so glad I didn’t paint it! Oh my gosh — the sanding that you did! I appreciate your commitment to this project. It turned out beautifully. Well done. I saw your link at Diana’s Adirondack Girl at Heart/Vintage Charm party. I definitely should I just stripped it lol but, you live you learn 🙂 Thank you so much for stopping by! Oh do I envy you that breath taking “tiger oak” dresser, what fabulous find, so lucky to have pieces you inherited. So many times younger people don’t want the old fashioned pieces that are so much better made than any new piece you’d ever find. Those old pieces were built to last a lifetime in most cases. And how fortunate and smart you are to live in your grand parents home. The things you have discovered tucked away in your family home are amazing, Tarah. You remind me that the back-stories of the objects we find are as interesting as the pieces themselves. Your dresser looks so beautiful; you did a wonderful job rehabbing it. Thanks so much for linking it up at Vintage Charm! Beautiful makeover! Thanks for sharing at Inspiration Monday! Although I adore a great paint job, some pieces are just not meant to be painted, especially those vintage ones that are structurally sound. All your hard word refinishing this piece to the original splendor really paid off, it is a stunner with all that wood grain, I love it! Brenda thank you so much! Some pieces just surprise me when I get to work on them, this one turned out so much better then I had ever hoped! I’m so glad you saved it!! And your hard work of sanding paid off. It looks beautiful 🙂 Thanks for linking up to #FridaysFurnitureFix! Oh my goodness this turned out gorgeous! Your hard work really paid off. It’s nice to see a piece brought back to it’s original glory … I am not sure I would have had the stamina or patience to do this! Well done! I hope you have a great day! Terry thank you so much! I was so relieved when it turned out! You did a beautiful job. Although I love painted furniture there are times when you need to respect a piece of furniture and restore it to its former glory. You did just that. Debra, thank you so much! I’m so glad it turned out! This piece looks gorgeous! I know that your grandmother would be so pleased to know that you’ve given this piece a facelift and that you are enjoying it. Paula, I think so too! I think Grandma would be glad 🙂 Thank you! Holy coolness!! Thank you so much! I’m gonna check it all out now, what fun! She’s the perfect a collectors piece for future generations. You did an amazing job restoring her to her former glory. Sometimes a piece of furniture can speak to you. And I think Tarah this is one of those times. This is really gorgeous and it looks so solid, as in a don’t-mess-with-me-I’m-here-to-stay-for-another-seventy-years kind of way. I’m so glad you kept it. As for all that sanding, couldn’t you have used an electric sander? It is one of the few power tools I use and it saved me aches and pains. Pinning at Sweet Inspiration. Hey Mary! 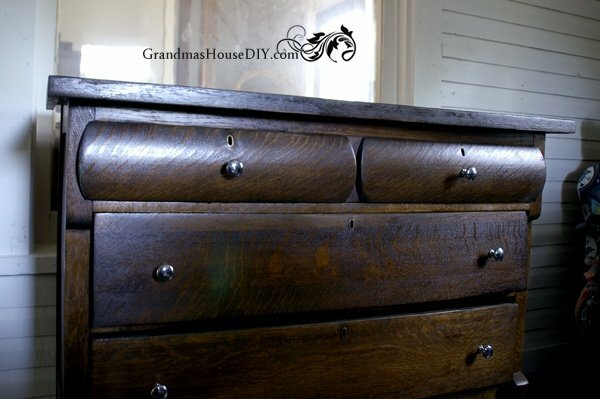 Thank you for your wonderful words, for sure this dresser is SO solid! I did use an electric sander 🙂 I really should have just stripped it and not killed myself but sometimes my stubbornness gets the best of me! Thank you for stopping by! This is such a wonderful piece. I was holding my breath, hoping it wasn’t going to be painted. You did an amazing job! It’s wonderful to see an old piece valued the way you do. 🙂 So glad you liked it! Thank you! Beautiful job! Thanks for sharing on the DIY party! This is stunning! My grandma had two very similar ones to yours, both a men’s and a ladies’, with the men’s being MUCH larger (and weighing in the area of 350 lbs if I remember correctly – my aunt took custody of that one.) The ladies’ I originally took and restored for my college apartment and first house (25 years ago)was very similar to yours, but also had a mirror and matching hope chest. I was able to restore the wood around the mirror but not the mirror itself. The story I have on ours is that my grandma’s family brought them with them when they immigrated from England in the mid 1800’s. The story has always been that they had been in the family much longer, to the tune of about 300 years but we have no way to easily prove or disprove that, but my mom remebers them always in her house growing up and she is pushing 80. I remember my grandmother telling me she got them from her dad; she would be in her 110’s now. The rest of the stories I honestly don’t remember who I heard what from. They were covered with a thick, somewhere between rust and cherry colored paint when I ended up with the pieces I got. I remember my grandma always had a vanity painted the same in the room she had them in, but other than the ugly paint, there was no reason to believe it was part of the set – it honestly appeared to be almost midcentury modern, but I really can’t imagine my grandparents buying during that time frame. I also sanded them all by hand, not knowing any better, though I was sure I knew everything at 18 and didn’t ask for help. It took me about 2 months to sand all of them, but I will mention it was August on the KS/MO border when I started, so time working in the hot garage was limited and I had only done two or three other smaller pieces at that time in life. The cedar/hope chest has copper accents on the corners and the lock is also copper, but none of the other pieces have copper that I recall – it is possible the large one does, as I remember it has a flip down desk over the middle two rows of drawers – the top row being rather small drawers – and I am almost positive had a lock on the desk when folded, and possibly on the smaller top drawers. It’s been almost 12 years since I have visited my aunt and wasn’t paying much attention at the time. (Sometime along the way my mother decided to “store” the dresser and mirror for me for “safekeeping” at her house and has now decided I can have them “when she moves on.” I haven’t been to her house in six years, so can’t provide pictures to compare, but I had not heard of tiger oak before either, but have always loved and been intrigued by the patterns since I discovered them. I have the cedar chest, but it is currently in my brother-in-law’s wood shop repairing a broken leg from his brother sitting on it to watch tv. Lol. 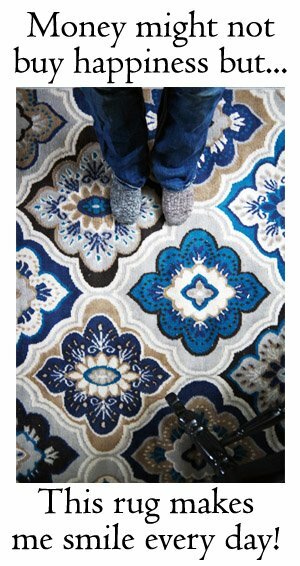 I am so glad I saw this in the diy daily email, and I will definitely have to start following your blog! My grandmother passed away in May of the year I was starting college 90 miles from where dhe had lived, and I happily furnished my apartment with treasures salvaged from her house after everyone rlse had gone through and decided most of the furniture, especially in the basement, wasn’t worth saving. I cherish it for the stories and absolutely treasure the connection to my very beloved grandmother, who most in the know say I got most of my personality from. I love having the day bed she purchased in 1918 for her room for her first teaching job, which was borrowed from her for a number of years when I was big enough to be out of a crib, and returned to extra dining room seating/extra bed when I chose my own bed, still clearly marked with the date and the store purchased from, and the dining room table she and my grandfather purchased for their first home, and handed down to my parents when they got married, to wind up in my first house, and currently my sewing table. Sorry to babble on so much, just thrilled to see something so familiar, and I am such a sucker for family stories like this! I was so relieved to be able to save my grandparents’ old house! My boyfriend (my husband now) and I at the time were just in the right place in both of our lives to be able to do it. We were just starting out together and this place called me so hard and he was happy to come along for the ride. Fortunate I think though, most folks don’t have the opportunity or just plain financially can’t do it. At the time I thought anyone would probably make the choice to save the old place like I did (if they were able) but once I got in here I really got a whole other look at the other side of things. It was really hard to tear this place a part even if it meant saving it for many more years to come and to have a home for us. It was still so tough to take out things that were so much a part of our family and my own child hood even though we had no choice in the matter to make it a safe home. It did make me realize and understand a lot more why people sell the old places and even the old pieces too sometimes, it can be really hard to change something (even if it means saving it) that meant a lot to you and your family. Granted though I would never go back for a minute! I’m very glad that we were the ones to save my grandparents’ old house even though it was really hard at times! Your home sounds lovely! I’ve often wished were closer to a bigger city! Hooray! Hooray! Applause! Applause! I am so glad you decided to redo your grandmother’s piece to show the beautiful wood it’s made of. So many people today slap on a coat of paint, which totally destroys the look of the vintage piece they are working on. Makes me cry! Thank you Sandy! Yup I’m real happy I decided to sand this down and refinish it, sometimes paint is ok but if its solid wood and in good condition, why on earth would you paint it!? Beautiful piece of furniture and you are so talented. They don’t make pieces like that anymore. Yeah they really don’t make solid pieces like this anymore at all, I was so glad to save it! Thank you Michelle for commenting and coming by! Tarahlynn, lovely piece of furniture. I have a similar piece but mine has a top with a mirror. I recently decided to paint it. Such functional pieces. Thank you for sharing at Your Inspired Design link Party. It is fabulous! Thanks for sharing it with us! So pretty! I’d love to have that in my home. Thanks for linking up with Funtastic Friday. Wow…looks so great!! 🙂 Nice job! Tarah, Love the dresser. The wood grain is really nice. Have you tried applying wax to the bottom of the drawer to help it slide easily. I have used this with some success. Sylvia D.
Thank you Sylvia, I will definitely need to try that! This is the kind of old piece of furniture that people wish they had! You are so lucky to have this gorgeous piece and you did a fantastic job! Thank you Stacey! I love this old piece, so glad it turned out! Thanks Ashleigh I’ll be there! Thanks Joanne! Glad to have a place to share! Such a lovely dresser. They just made them better back in the good ole days. Lovely job on refinishing it. It turned out beautifully. Thank you so much for sharing at the Monday Mish Mash Link Party! Beautiful transformation. I so admire people for taking on these projects. The wood grain is quite lovely. Thanks so much for sharing your creativity at DI&DI. I love the lines on this beauty and the story behind it! You did an amazing job transforming it! Thanks for sharing with SYC. That turned out so lovely! Simple and holding to it’s antique origins, but with a modern look. Thank you for linking this up over at the Happy Now! Carla, isn’t that the truth? Old furniture is so much better built then the new stuff nowadays! Thanks for coming by!! Look at those beautiful legs on that dresser. I love legs with style. Thanks for linking up at Let’s Get Real Friday Link Up. I love all of your furniture facelifts! I can’t wait until we finally close on our house. I have a few facelifts that I want to do. I guess you’ve inspired me! Pam, that’s awesome I would love to see some of your facelifts! Thanks! So great you’re domestic. I’m not at all. What a fabulous piece! Once again, you did a wonderful job. Thanks for sharing. I just can’t get enough of this dresser. I could look at it all day and still find it interesting! What a beauty. Although I like painted furniture there are some pieces that should never be painted and this is one of them. The sanding ordeal was well worth the end result. Thanks Debra, it did end up totally worth it! What a find, with wonderful grain! I don’t think I would have painted it either, all your hard work paid off she’s a beauty! Thanks so much for sharing it at Fridays Furniture Fix! What beautiful woodgrain! Your hard work and persistent sanding really paid off. Pinned! Thank you for sharing at My Busy Beehives #beeparty this week! Wow, your dresser turned out beautifully. Thanks for sharing your wonderful posts at Over The Moon Party. It’s gorgeous! And I am soooo glad you stained it rather than painted it! Thank you Jean, it would have been a shame to cover that pretty wood up! Thank you Sam! This was one of my very favorites! This came out beautiful! I had to go back to see if I read it right when you mentioned black stain and I did, but it looks like it almost translated as a beautiful walnut color. Thank you Karen! Yes it was black stain actually, it surprised me it ended up much more brown then black but it definitely allowed the true color of the wood to shine, thanks for coming by! It’s a great oak piece and your refinishing turned out great. 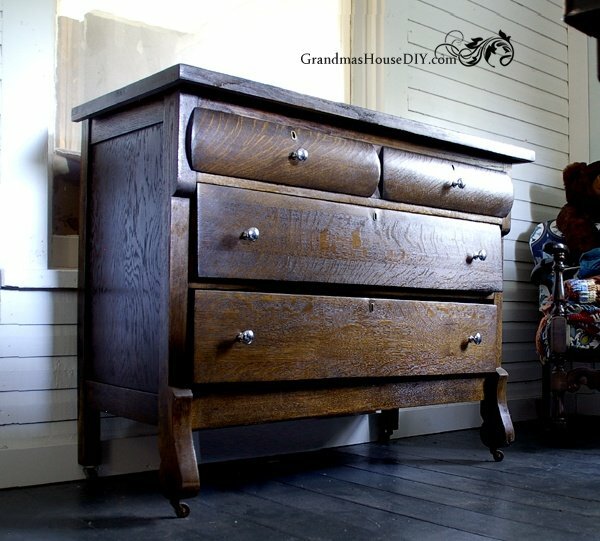 I inherited a double dresser and a washstand that are similar to your dresser. 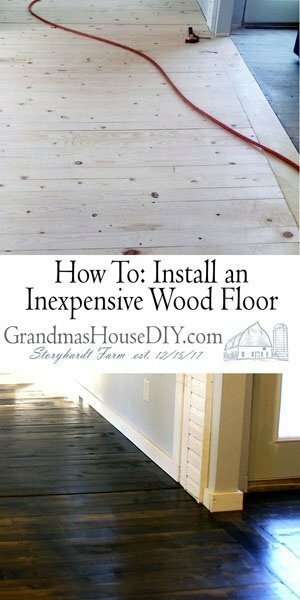 I refinished them many years ago and I can tell you that stripping them wasn’t any more fun than sanding! Very true Lisa! Stripping is whole other beast besides sanding lol, thanks for coming by! What a cool looking dresser. Love how this project turned out. It’s a lovely dresser and you did a wonderful job! Thank you for sharing at The Really Crafty Link Party this week. Pinned! You did a wonderful job on that dresser. 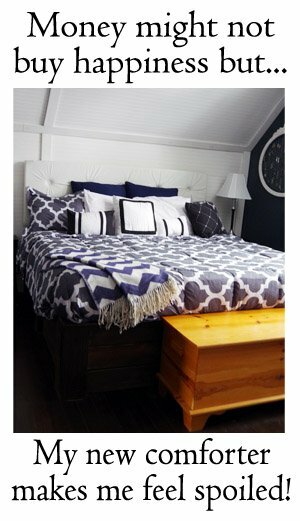 So glad you opted to use stain rather than cover up that gorgeous woodgrain with paint! Paint can cover a multitude of sins, but beautiful woodgrain should be allowed to shine! Thank you so much Kathy! I do love painted furniture but sometimes it is a real travesty to cover these old beauties up! I can’t imagine doing that much sanding! well done to you – looks fab!